Every so often, an emergency happens in aviation. 17. April 2018 was one such day. The left engine on Southwest flight 1380 failed. Shrapnel escaped from the engine, damaged the airplane, and broke a window. Sadly, that killed one of the passengers on board. And then news filled with phrases like “heroic pilot” and “nerves of steel”, framing the story around one person who performed well that day. You pilots have probably heard about a proposal to exempt certain pilots, who fly recreationally, from having to hold a Class 3 Medical Certificate. Instead they would take training on how to better make their own decisions about whether they are fit for flight. Their drivers license would be the document which shows they meet basic medical requirements. This proposal is open for comments from the public now. I made a comment, which I’ve included below. If you are interested in the subject, I encourage you to chime in also. You don’t need to be a pilot, or a US citizen, to comment. Just go to Regulations.gov and look for Document ID FAA-2012-0350-0001. I encourage you to read about the proposal, and consult EAA’s guides for commenting (PDF). For those who haven’t heard, here is some background. Pilots who fly for fun with US licenses, for example me, need to be medically fit enough to make the flight safely. For most general aviation pilots, that means getting a Federal Aviation Administration (FAA) medical certificate. Those who fly for pay need a stricter Class 1 medical, those who fly for fun can get a Class 3 medical. I agree with those who make the case that the money the FAA spends on the Class 3 medical, and the restrictions it places on pilots exercising their freedom to fly, is out of proportion to the small safety benefit all that hassle provides. Not that many accidents result from unfit pilots. A medical exam once every two (for me) or five (for you whippersnappers) years doesn’t really catch all that much. And both anecdotes and my own experience say that the FAA medical office imposes creeping burdens on pilots by a) demanding more and more doctors statements, each costing someone money, and b) delaying the issuance of certificates, grounding pilots. I would be happy if the Class 3 medical were abolished altogether. The aviation groups who know these things say that the FAA is not willing to contemplate abolishing the Class 3 medical. (Someone has tried, and just got turned down.) They think, however, that they might succeed in persuading the FAA to exempt certain pilots doing certain low-stakes recreational flights from having to hold the Class 3 Medical Certificate. Two of the groups, the Experimental Aircraft Association (EAA) and Aircraft Owners and Pilots Association (AOPA), just submitted a request for this exemption. They think they have carefully crafted it to maximise its chances of getting approved by the FAA. For instance, it requests an exemption from a rule, instead of a change to a rule. I am a US citizen and private pilot, resident in Canada and flying recreationally in Canada and the USA. I hold a Private Pilots License and 3rd Class Medical certificate from each of Transport Canada, and the FAA. I have about 220 total hours of total pilot time. I am exactly the kind of safety-oriented, recreational pilot who would benefit from this exemption. And I am suffering from the cost and burden of jumping through the hoops for an FAA 3rd Class medical certificate, costs and burdens which I argue do not greatly increase safety. I am in my late 40s, and have had two chronic medical conditions for decades. I disclosed both when I applied for my FAA medical certificate six years ago. The FAA decided that one condition required annual physician reports, and the other didn’t. Then, last year, the FAA started to require annual reports on the other condition. Complying with these reports costs hundreds of dollars, and considerable hassle, each year. However, these are chronic conditions which don’t prevent me from flying safely. When flareups happen, I detect them and ground myself until they pass. It is that personal discipline which provides medical safety. I am on the verge of abandoning the FAA 3rd Class Medical, and with it any flight of US-registered aircraft, due to this burden. My contribution to the US economy will drop accordingly. The exemption requested here would relieve me of the annual burden of the 3rd Class Medical, a mechanism which doesn’t provide much safety. And it would reinforce my training and personal decision-making, which is the mechanism which does ensure my safety. I request the FAA fully count the status quo burden of a creeping rise in special reporting requirements for 3rd Class Medical applicants, in evaluating this proposal. CZBB, Boundary Bay airport, is my home field. I rent aircraft from Pacific Flying Club there. 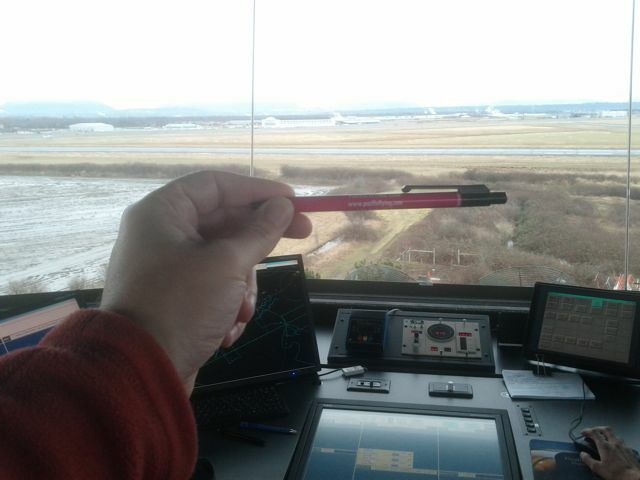 And the friendly air traffic controllers in the CZBB control tower are my rock and my safety. Saturday, I was at the airport with some spare time, and lousy weather made it a quiet day on the airfield. So I drove over to the tower for a brief visit. I had a great chat and got some nice pictures. One of my community service projects is volunteering with CASARA BC, the Civil Air Search and Rescue Association in British Columbia. They are a great bunch of folks providing a very important service. But they are hidden in a Romulan cloaking device as far as the Web is concerned. When I tried to join them, I couldn’t find a single page that described the basics of who what where when how and why they are and do. So I’m writing it, and here it is. I hope this will be helpful to others, at least until CASARA BC gets an official recruiting page up.